Most people are aware of the name John Eldredge. Oh yeah, that’s the Wild at Heart guy, right? Who knows how many copies that specific book has sold. I’m sure it’s in the millions. Interestingly enough, he’s actually written quite a few other books. It’s just that Wild at Heart made him known. 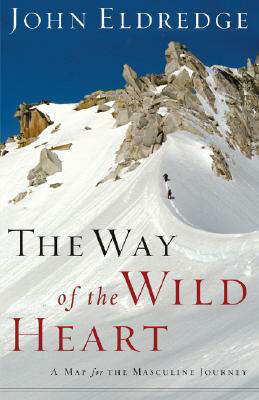 I’ve just recently finished reading Eldredge’s book, The Way of the Wild Heart. It’s actually my third time through the book. I first read it while on my honeymoon two and a half years ago (great book to pack for the honeymoon) and have since read through it two other times with two different groups of guys. It’s been good to discuss the book with other guys. I must admit that I do like John Eldredge’s writings. Some might claim I am an Eldredge-addict. But I think he has some wise and insightful thoughts on our spiritual journey in Christ. The sad thing for me is that he has become somewhat of a Christian celebrity due to the success of Wild at Heart, though he has also had his fair share of critics. I remember back in the late 90’s when his first book was released, The Sacred Romance, with co-author Brent Curtis who was, unfortunately, killed in a climbing accident not too long after the book’s release. But, now, Eldredge is one of the most popular American Christian authors of today. The reason I mention such adulation as a sad thing is that this seems to be the usual path of American Christianity. Build platforms, make celebrities, and add a little lights, cameras and action in there while you’re at it. I’m not even saying Eldredge had that as his purpose in writing such books. He actually shares about his reluctancy in writing the very first book. But, whereas he was a more grass-roots, unknown author in the late 90’s, he has now turned into one of the most well-known American Christian writers, popping out books, study guides for those books, and other little extras left and right. I sometimes wonder if he, too, has fallen into such a trap. Still, I really do appreciate Eldredge’s thoughts on the Christian life. He’s no theologian by any means, but he has some very keen and brilliant insights into our life in Christ, and especially for the male journey. He has been greatly influenced by the writings of people like C.S. Lewis, George McDonald (who, himself, was a great influence on Lewis), and other classical spiritual writers. Eldredge has somewhat of a pastoral heart to see people released into the full joy and freedom that is ours in Christ. Specifically, The Way of the Wild Heart is a follow-up to the best-seller, Wild at Heart. As all good American authors and screenwriters know, if the first does well, you have to put out a second. Thus, the release of The Way of the Wild Heart. This is seen in all stories, all movies, and even through the Scripture. It sure brings an American twist to the call and journey of a man, but, nonetheless, I think it is an overall good representation of the masculine life. More than anything, his point is that God wants to come and father us through each of these stages. No doubt, some of these stages will overlap and, at times, you will be drawn to revisit a specific stage. But, in general, these are the six stages a man passes through in life. I will expound on each stage very briefly. Beloved Son – When a boy is young, he longs to know he is the beloved son. Not because he has done something to earn such favour, but simply because he is loved and adored by his father. Mom’s love is good and right. But, for the son, they need the father’s love. Hence the devastation in a home with an absent father. Yet, this fathering role of the beloved son could be filled by another man – a spiritual father of sorts. Sometimes, young boys are asked to grow up too quick, as when the father leaves the home through divorce and states, ‘Your the man of the house now.’ This is too much for an eight-year old or even a fifteen year old. A boy needs time to be the beloved son. Cowboy – This is the time of reaching adolescence and the stage will probably run through to one’s late teens or early twenties. Such a stage calls for adventure and exploring, getting to know life and all of its ways. Again, it is paramount to have a father figure to help the adolescent grow up but, no doubt, the father’s role will have changed slightly. This is a time to let the son out – let him hang out with his friends, go on trips with his friends, maybe do a little study overseas, etc. But this is a time for him to step out of the nest and grow up into greater things. Warrior – Such a season consists of the young man learning how to battle. Not necessarily through real fights, but through battling for their own life in Christ and the life of others. They will learn strength and they will learn how to deal with failure. This is quite like the days of David on the run from Saul, or that window we get into Christ’s life at His temptation by Satan. But, in all, they are being formed to be a faithful and courageous warrior. Lover – A time will come when a woman has caught the eye of the man – her beauty, her character, her smile, her laugh, etc. God has created man to find that great mutual helper that will become his wife. Sometimes the boy becomes heartbroken at the loss of such a love, and healing will be needed. But God has such a gift for men. During this season, a man will learn how to be a great lover to his beloved in learning deep intimacy of the heart. And, even more, this is a time when we can be awakened to the Great Lover and His pursuit of us, which becomes the reality even for those of us unmarried. King – Entering the later stages of life, one becomes a king over his ‘kingdom’. It might be small, as in a very small business or small group, or it might be larger, as in leading a church of a few hundred or being the CEO of a major corporation. In all, we are called to rule and we are called to rule well. Yet, as with all stages, this one will present grave difficulties which we are called to rule over. But the Great King commissions us to rule and, thus, we can do so in His strength. Sage – This is the last and final stage of one’s life. This is the time that we step aside and allow other kings to take their place. Yet, Eldredge challenges us that, whereas many are looking to settle down and pick up golf in the latter years of one’s life, this is a time to not go into vacation mode. Rather, we are to look to impart wisdom and life to other men, especially other kings. Sages are not only graced with great wisdom, but also with great compassion. Thus, we have the six stages of life. Again, while these are general markers in a life of transitioning from one stage to the next, there will be overlap in the transition and there will be times we re-visit earlier stages. What king doesn’t also need to know he is still the beloved son of the Father? I know that Eldredge comes across as an outdoorsy type of guy. I would suspect such, for that is who he is. He lives in Colorado and he loves camping, backpacking, hiking, mountain climbing, white-water rafting, canoeing, etc. And while he does admit that one doesn’t have to be a complete outdoors type of guy, he does believe there is something about men and the outdoors. This is all found in the reality that Adam was created outside the Garden (Genesis 2:7-8). To this, I would agree. But I would also guard a little more against making men feel less-than-manly if they are not that outdoorsy type. That can come across in both books. Still, I would recommend that men, especially American Christian men, read this book (I have sometimes found it that non-American men do not really understand Eldredge’s heart). I believe God has given John Eldredge great insight into the masculine journey and, therefore, I think we can benefit from his words in the first book, Wild at Heart, and in this second book, The Way of the Wild Heart. Thus ends my review of this book. If you want to read more about Eldredge, his ministry (Ransomed Heart) and his other books, visit his website – www.ransomedheart.com. This entry was tagged book review, books, John Eldredge, The Way of the Wild Heart, Wild at Heart. Bookmark the permalink. Good book. I also recommend “Walking With God”, his book about daily intimacy with God. I also read Walking With God. It was like reading his own devotional thoughts and journal. I think I will always read Eldredge’s books, but I wouldn’t say the book was one of his better ones. Still, I think it is one that others should look into. I don’t know if you would be interested, but God has laid it on my heart to start an online network of guys who would want to bond together to sharpen each other in their faith. Would also be a very personal way to find other men to be accountable to. However I want to use Wild At Heart as sort of a curriculum, along with the field manual that goes with it. If you would be interested in something like that join the Facebook page I have created: http://www.facebook.com/pages/Taking-Back-the-Heart-of-a-Man/187652704579857. This is a brand new idea and has not taken off yet, as I am still looking for men who would like to commit to this after considerable prayer. Once you join the page, send me a message with your email address and some expectations you would have for the group. Once I get a group of guys together I will start a private blog where we will weekly share with each other what God has laid on our hearts and discuss it. It will be set up as a private forum basically, accessible to members only. Thanks for the comment. I actually think the best set up for this is people with in our own local churches and areas, people we can meet with on a flesh-and-blood basis. I believe that provides the best support. I love blogging and interacting. But for relational strength, I believe the best starts with those we can have actual, personal relationships with in our local church and surrounding community. Thanks for the response! Believe it or not I understand exactly where you are coming from. I actually could not agree with you more, and here in Indianapolis I am trying to exactly what you described. The purpose of the “online outreach” is for those who maybe don’t have the people they need in their lives to do a group study. Maybe there are guys out there who arent READY to face other men an open up in the way you know they will. They have to understand that the wound is there and be ready to fix it before they can face another man in person. Then I think about friends that I have who travel for work and cant commit to a weekly group meeting. This is perfect for them. All that aside I 100% agree that a face-to-face men’s group is what is best. Thank you for your input and thoughts! Really John Eldredge gives out brilliant dedication. I don’t read this type of books earlier. The way of the wild heart is the most excellent one. Thanks for sharing a bit of John Eldredge. I am listening to this audiobook, and I’m really enjoying Eldredge’s insights since I’m a wife and mom-of-a-boy. Would you mind sharing the prayers at the end of each stage? I would love to adapt those to pray them for my husband and son.